This isn’t a foreign concept. As a matter of fact, there are many auto repair professionals who do just that for a living. However, franchise and independent service shops still outnumber mobile repair businesses by a wide margin. Mobile auto repair is a very attractive service to many consumers, given the inconvenience of dropping off their vehicle and arranging rides while carless. So why isn’t mobile auto repair a more widely available service? In this article, I’d like to first address some of the challenges this business model presents, and then explain how it can be successful despite the major obstacles. In a world of technology and convenience, it’s logical that a mechanic would come right to your home to service or repair your vehicle. However, house-call repairs are easier said than done. 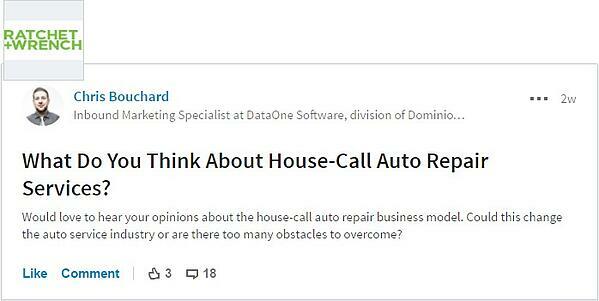 I posed a broad question in a few auto repair LinkedIn groups, such as the one below, and received a lot of valuable input –largely the challenges involved in mobile auto repair– from current auto repair professionals in all different job roles. Tools & Equipment - Not able to carry all necessary tools or heavy equipment, such as a lift. Having tools and equipment easily accessible at the shop is ideal. Location - The client may not have the best set up, such as a garage or even driveway. Some office parks and gated communities might not even allow vehicle maintenance and repair on their property at all. Parts - Obtaining parts can be challenging and time-consuming. Some jobs end up needing additional parts for repairs that were not originally diagnosed. Many customers believe that rates should be significantly cheaper since the mechanics don’t have shop overhead. However, mobile repair jobs often take longer and there are many other expenses involved. The overwhelming majority of respondents came to the conclusion that mobile auto repair can work well for diagnostics, basic maintenance, and smaller repair jobs. For jobs that require a lift or specialty tools that are not easily portable, customers should come to the shop. This makes perfect sense for a one-man operation and smaller businesses, as it’s very difficult to charge a fair rate and still be profitable on larger jobs that require heavy-duty equipment and many labor hours. However, larger businesses with greater resources can offer most, if not all, maintenance and repair services on the road. There are a couple tech-savvy mobile auto repair disruptors out there who are finding great success performing house-calls for all job sizes with fair and transparent pricing. YourMechanic, servicing 2,000+ U.S. cities and growing, performs over 600 different services. Customers save up to 30% in maintenance and repair costs and can schedule appointments 7 days a week. YourMechanic has several operations and logistic teams that take care of booking appointments and parts ordering, allowing their highly-qualified mechanics to focus solely on the maintenance or repair work. Customers are paired with the best-fitting mechanics based on the nature of the job and location of the customer’s home or work. Many of the mechanics in YourMechanic's network can perform services you'd normally expect to be limited to a shop by bringing jacks and jack stands to lift up your car. I spoke with the CEO and co-founder of YourMechanic, Art Agrawal, about how the business came about and how they have been able to find success despite some of the major challenges mentioned in the LinkedIn group conversations. “Our initial business model wasn’t centered on mobile mechanics, but was based on fair and transparent pricing," stated Agrawal. "At YourMechanic, we give the same fair price to everyone and show the cost of labor and parts upfront for each service so you know exactly what it takes to fix your car." "I began consulting with mechanics to learn more about the industry. I’d assumed that mechanics had to work out of brick-and-mortar shops because they needed heavy-duty equipment and large bays, but when I realized this wasn’t the case, and that mechanics can perform the vast majority of car repair and maintenance work with equipment that can fit in the trunk of a car, the model was quickly changed," said Agrawal. "Now, YourMechanic focuses on mobile mechanics while delivering the same fair price guarantee." "The response from our customers has been overwhelmingly positive – they can’t believe how easy it is to get their cars fixed and serviced for routine maintenance. It’s completely hassle-free,” added Agrawal. YourMechanic has continued to add value to their business with a recently launched chatbot for car owners to book appointments or browse tips and advice from mechanics. ClickMechanic, located in the UK, is another great example of a successful mobile auto repair business disrupting the typical brick-and-mortar business model. Similar to YourMechanic, ClickMechanic is less expensive than the average garage or franchise dealer, their mechanics are vetted to the highest industry standards, and they offer efficient online booking. Andrew Jervis, Co-Founder of ClickMechanic, and his team run a tight ship, assuring they provide the highest quality of work that keeps customers coming back. "With being mobile and conducting the work at the customer's home, it's extra important to be super professional and mindful of where you're working," said Jervis. "Make sure you leave no mess, keep the customer updated and get the work done in a timely manner." ClickMechanic has continued to grow with mechanics in over 100 towns and cities across the UK, offering a wide variety of services and repairs. Operations and logistics teams to manage bookings, parts ordering , etc. As mentioned earlier, there are many challenges and limitations with mobile auto repair, especially for lone rangers and small businesses. These key features and benefits that have brought success to YourMechanic and ClickMechanic just aren’t possible to replicate without a large enough team. Independent mechanics might look into working for one of these companies as an alternative. The small percentage of revenue these companies take is worth it to avoid some of the logistical headaches that have turned off so many mechanics. Should we expect to see more of these businesses in the near future? In a rapidly changing industry, it’s definitely not out of the question. For the longest time, buying a vehicle completely online wasn’t even an option and now it’s the industry buzz. So, it’s possible that we see more mobile/house-call auto repair businesses over the next couple years.